God has determined the course of history in advance, and The Jesus Prophecy is the most exact demonstration of the Father’s control of time. He definitely knows the end from the beginning. The book of Daniel in the Bible has many prophecies. Some foretold the rise and fall of empires, the appearance of a great religious power, the change of times and laws. But the greatest event of world history yet today divides all dates before (BC) and after (AD) the advent of Jesus Christ on this earth. We can look at any calendar and know just about how many years ago that was. Daniel and his people had been held captive in Babylon for 70 years, just the number of years that had been foretold by JeremiahJeremiah 25:11-12: "And the whole land shall be a desolation, an astonishment; and these nations shall serve the king of Babylon seventy years. And it shall come to pass, when seventy years are accomplished, I will punish the king of Babylon, and that nation, saith the LORD..." long before. Babylon fell to the Medes and the Persians in 539 BC just as Isaiah had even named CyrusIsaiah 45:1 "Thus saith the LORD to his anointed, to Cyrus, whose right hand I have holden, to subdue nations before him; and I will loose the loins of kings, to open before him the two leaved gates; and the gates shall not be shut." over 150 years before his birth! Now the time had come. Darius the Mede reigned over Babylon. And in his first year Daniel the prophet began to study the prophecies. He went back to JeremiahDaniel 9:1-3 "In the first year of Darius the son of Ahasuerus, of the seed of the Medes, which was made king over the realm of the Chaldeans; In the first year of his reign I Daniel understood by books the number of the years, whereof the word of the LORD came to Jeremiah the prophet, that he would accomplish seventy years in the desolations of Jerusalem." to verify God’s word. Daniel, was now nearly 80 years old. In chapter 8 he had seen a visionDaniel 8:13,14 "Then I heard one saint speaking, and another saint said unto that certain one which spake, How long shall be the vision of the daily and the transgression of desolation, to give both the sanctuary and the host to be trodden under foot? And he said unto me, Unto two thousand and three hundred days; then shall the sanctuary be cleansed." that included a mysterious number: 2300 evening and mornings—a period of time that was yet to transpire before the sanctuary would be “cleansed.” Daniel immediately thought of the temple in Jerusalem which still lay in ruins ever since its destruction by Nebuchadnezzar in 586 BC. If it was to be restored in only 2300 days, Daniel would have rejoiced! After 70 years in Babylon, another 6 ½ years would be good news! But Daniel was told that “the vision of the evening and the morning which was told is true: wherefore shut thou up the vision; for it shall be for many days. And I Daniel fainted, and was sick certain days; …and I was astonished at the vision, but none understood it. Daniel 8:26,27. 2300 years was indeed “many days.” Yes, a very long time. While he was still praying, the angel Gabriel came to “understand the matter and consider the vision.” (23). Gabriel begins with the number 70. But rather than 70 years, it is 70 weeks! The first 70 weeks (490 days of the entire 2300) would bring in “Messiah the Prince.” The promised One, the Seed of the woman (Genesis 3:15), the Lamb of God (Genesis 22:8; Isaiah 53:7), would finally come! But 70 weeks is not even two years. Surely prophetic time is a different kind of time. It is. Now, let’s examine The Jesus Prophecy of the 70 Weeks of Daniel 9. 70 weeks are determined upon the people or 490 days (“each day for a year” Numbers 14:34; “I have appointed you a day for a year” Ezekiel 4:6) or 490 years. Daniel 9:25. “From the going forth of the commandment to rebuild Jerusalem unto Messiah the Prince shall be 69 weeks” Daniel 9:26. Cyrus and then Darius issued decrees for the Jewish captives to return to Jerusalem. But it was the decree of Artexerxes in 457 BC as recorded in Ezra 7 in the Persian king’s seventh year that provided autonomy and self-rule to the Jews under the laws of Moses, and rebuilding the wall and temple from the royal treasury. 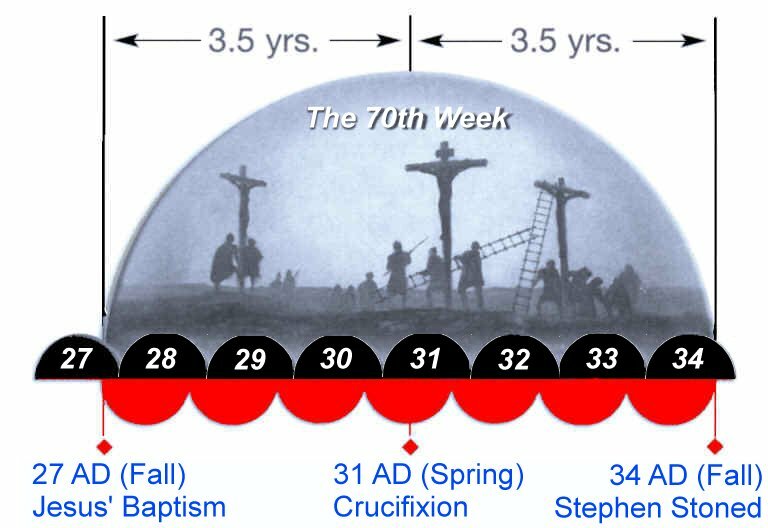 69 weeks of years later, one week short of 70 was 483 years after 457 BC. 70 weeks or 490 years is exactly 10 jubilees. Every seven years the land would rest, and after seven “land sabbaths” a second land rest on the 50th year marked the jubilee, when all land was returned to the original owners. The only known jubilee in the Bible was exactly 5 jubilees prior to 457 in 702 BC when Jerusalem was besieged by Assyria and king Hezekiah was given a sign: two years when no crops would be planted, two land sabbaths in a row. 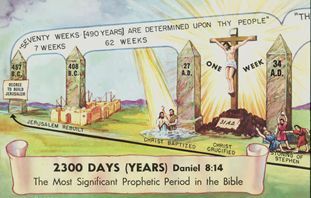 “The street shall be built again, and the wall, even in troublous times.” Daniel 9:25 The wall was initially built in 49 years (7 weeks) which is how the time was specified: “seven weeks, and threescore and two weeks”. It was during this time that the Samaritans opposed the building and burnt the gates. Nehemiah received word of this and obtained permission to return to Jerusalem in 444 BC and rebuild the wall in 52 days. Nehemiah 6:15. As the 69th week approached, many began to look for the coming of the prophesied Messiah. Wisemen came from the east to Jerusalem, saying, Where is He that is born King of the Jews for we have seen his star in the east” Matthew 2:1. Simeon waited for the “consolation of Israel and it was revealed to him that he should not see death before he had seen the Lord’s Christ” Luke 2:25,26. In 27 AD Jesus was baptized in the Jordan being “about 30 years of age” in the 15th year of the reign of Tiberius Caesar. Luke 3:1,23. Then Jesus “came into Galilee…saying, “The time is fulfilled, and the kingdom of God is at hand” Mark 1:14,15. It was the beginning of the 70th week, a sabbatical year, when captives were to be set free, and he land was to rest. Thus Jesus “as His custom was, went into the synagogue on the Sabbath day, and read…The Spirit of the Lord is upon me because He has anointed me to preach the gospel to the poor, to heal the broken hearted, to preach deliverance to the captives, and recovering of sight to the blind, to set at liberty them that are bruised, to preach the acceptable year of the Lord” Luke 4:16-19. The year of the Messiah, the anointed One, the Lamb of God had finally arrived right in the midst of the 70th week. “And he shall confirm the covenant with many for one week: and in the midst of the week he shall cause the sacrifice and the oblation to cease” Daniel 9:27. In the midst of the last seven years, the Messiah would cause sacrifice and oblation to cease. Then “shall Messiah be cut off, but not for himself” verse 26. The death of the Lamb of God brought to an end the shedding of animal blood. Hebrews 10:8,9. For 3½ years Jesus taught, and preached, and healed, and then confirmed the covenant with his own blood. And He said, “This is my blood of the new covenant which is shed for many” Matthew 26:28. Then for an additional 3½ years the disciples confirmed his death and resurrection to all in Jerusalem. His “great salvation, which at the first began to be spoken by the Lord, and was confirmed unto us by them that heard” Hebrews 2:3. In 34 AD, at the end of the 490 years, the 70 weeks, the final rejection was made. The time determined upon the Jewish people had come to an end. They rejected Jesus as the Son of God and crucified him. Now they rejected the testimony of Stephen who saw “Jesus standing on the right hand of God” Acts 7:55. It was a time of judgment. “The Lord stands up to plead, and stands to judge the people” Isaiah 3:13. When Jesus stands it’s time to judge. It was time for the gospel to go to the Gentiles. Paul met Jesus on the road to Damascus in pursuit of Christians and was converted on the spot. “Straightway he preached Christ in the synagogues that He is the Son of God” Acts 9:20. When the Jews spoke against him, “contradicting and blaspheming” He said, “It was necessary that the word of God should first have been spoken to you: but seeing you put it from you, and judge your-selves unworthy of everlasting life, we turn to the Gentiles.” Acts 13:45,46. Jesus now ministers as our High Priest in heaven before His Father (Hebrews 4:15; 8:1; Rev 5:6). For more information see "Your High Priest." Someday soon He will stand up again (Daniel 12:1) and he will say, “the time is at hand. He that is unjust, let him be unjust still…He that is righteous, let him be righteous still” Revelation 22:10,11. Watch! Jesus said, For you know not what hour your Lord shall come. But now that the 2300 years are fulfilled, we know that His coming is near, “even at the doors.” Matthew 24.